The Design Angel - Help! Which colour should I use in my design? Help! Which colour should I use in my design? A Quick Guide to Using Colour! What colour red and which spec to use? You’ve decided to decorate and suddenly find your wall not covered in one shade of your favourite paint but a mosaic effect in a variety of shades of that colour? Same with designing and producing your own literature…With such a range of hues to choose from, adding colour to a leaflet or poster can be a long job with many choices! So when you have decided and tweaked your chosen shade of red on screen, you suddenly find it changes when converted to your web page or when printed becomes a muddy shade of pink! Probable cause, the wrong colour definition for the wrong media! In simpler terms you have used the wrong colour reference in the wrong place. Below is a simple explanation and suggested place to use them…. 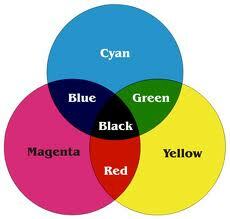 CMYK is the most common colour model for Four Colour printing. The use of Cyan, Magenta, Yellow and Black ink can create almost any colour imaginable and prints high quality photographic or graphic images. This is called a ‘subtractive” process which can explained as the more ink added the darker the image becomes, ie white paper is the base and ink is added in order of Cyan, Magenta, Yellow and finally black so darkening the final result. 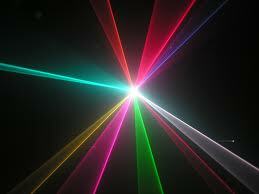 RGB, the process all screens use to create visual colour. Red, Green, and Blue are the colours of light, that when combined together create the spectrum of colours based on what the human eye can perceive. All colours are represented by a combination of numbers each ranging between 0 and 255. The method here is ‘Additive’, which originates with no light (255) as in a black screen and as light is introduced the colours brighten until all three lights are brought together and create white light (0)! RGB is also used in photography and scanning and is device dependant which means depending on the quality of the equipment RGB values can change slightly. Don’t send files to your printer in RGB, your results will not be as you hope or you may incur costs from the printer for amending the files. When working in Photoshop on photographic/illustrative files, work in RGB and convert when finished to CMYK. Colours for the web, are usually specified using RGB which are converted to the Hexadecimal model which is more HTML friendly. All codes begin with a ‘#’. At one time there were only 256 basic web safe colours but now with 16 and 24 bit (Truecolour) web safe colours are now almost practically forgotten. However problems do occur with inconsistency. 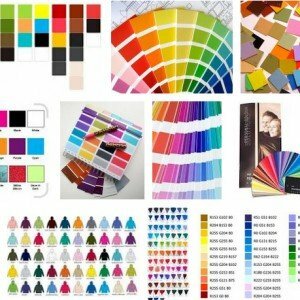 Specify colours using ‘Hex” for your web designer – he will love you! Pantone Colour Matching system is a standardised system to ensure once a colour is specified it has a universal code to ensure perfect matching in print. It uses ‘special’ colours that are supplied or mixed using 13 base pigments (15 including black and white). Most Pantone colours are beyond the CMYK capabilities and although today conversions exist for all pantone colours the CMYK equivalent can vary considerably. There are specifications for printing each colour on uncoated and coated paper. Pantone also supply fluorescents and metallic colours. When using a special or ‘spot’ colour it can be alone or alongside the standard CMYK print process. Trial and error in matching colours can be irritating and even the right colour can slightly vary with different print suppliers. When colour matching is crucial send a sample for the printer to match to, it helps them keep you happy!